The involvement of the Fuller family in shaping Ottawa’s landscape dates back to 1859. Today the company is responsible for projects ranging from industrial to educational; those involving complex co-ordination including community and large civil projects, and those of a sensitive nature including healthcare and heritage restoration efforts. Part of the architectural team for the original Parliament buildings in Ottawa, Thomas Fuller went on to be supervising architect for all of the projects in the Parliamentary Precinct and later chief architect for the Dominion of Canada. His son, Thomas W. Fuller became chief architect in 1927 and his son, Thomas G. Fuller, began his work as a contractor in 1939. Today his sons, William, Mark, Antony and Simon, are at the helm of Fuller Group of Companies and are joined by many members of the fifth generation of Fullers to be active in Ottawa’s construction industry. He says the company is successful, in part because of its focus on education and training and the torch of knowledge that has been passed from generation to generation, and shared among the company’s employees. As a family run business, she says the members have the opportunity to help develop the company, to sit down regularly to learn about all of the projects the company is engaged in, their challenges, and their successes. 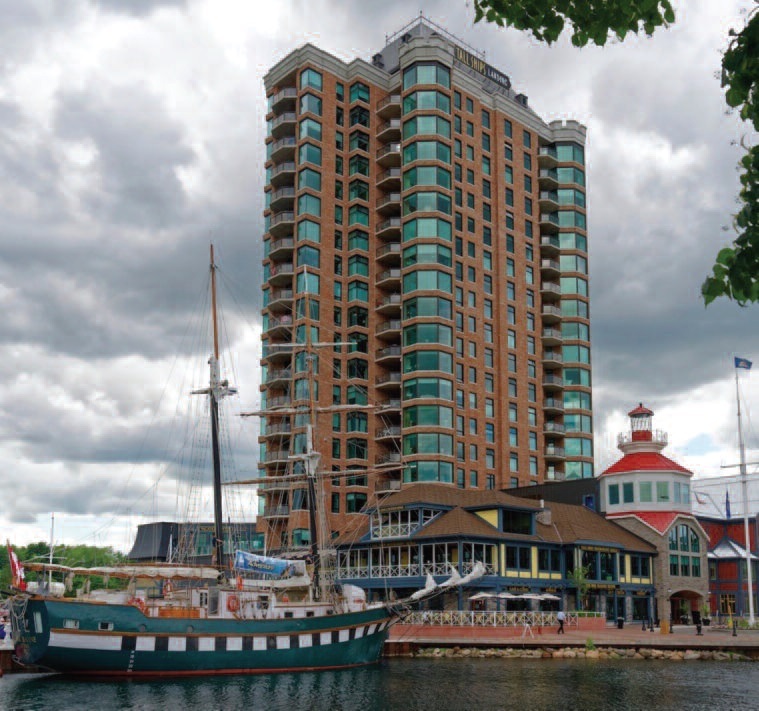 Located in Brockville, the $114 million Tall Ships Landing condominium project is set on 3.5 acres along Tunnel Bay Harbour. Phase one of the project involved the construction of 85 Cottage-inium Suites (a name coined to describe these luxury condos supported by a vibrant recreational lifestyle) in a stunning 16-storey structure overlooking the water. Currently about 80 per cent occupied, Sam says phase two – which will add another 65 units – has not yet been scheduled. “Earlier this year we commissioned the café and retail phases of the project and both are doing very well.” Fuller both constructed and owns the building. He says an opportunity for local employment – both Brockville and the surrounding metropolitan areas – is important, and it also provided Fuller the chance to work with trades they knew on this complex project. He says the pilot project provided the team with many insights which will transfer to future phases. Connected to the Tall Ships Landing project is the Aquatarium, a 26,000 sq. ft. building combining exhibits and interactive technology. Designed to help visitors explore and understand the Thousand Islands areas, this has been Fuller’s first foray into a new construction for this kind of project. “We’ve done renovations in museums before and they are always fun and interesting but this was something truly unique,” says Leigh. Among the more distinct features are a rock wall feature installed in the otter pen, an underwater tunnel and a boat exhibit that includes mock ups of two historic ships. Intended to engage visitors and their imaginations, Sam says attendance at the Aquatarium has been beyond expectations. Fuller completed a complex new 51,000 sq. ft. addition to Earl of March Secondary School in Kanata, intended to house the school’s grade 7 and 8 students. Located on the south side of the original school, construction included a two-storey addition, a single storey gymnasium two-storeys in height and a music and drama area one and a half-storeys high. A new road and paved hard surface area were also constructed. Leigh says one of the most unique aspects of the project is a two-storey glass atrium which brings natural light into the building and creates a unique gathering space for students. Involving the construction of a new pump station, reservoir, roads, lighting and watermain system, Sam says the East Quadrant Water Distribution Expansion is one of many civil projects Fuller has undertaken. Work has recently commenced on a similar project, the Peterborough Water St. Pumphouse and Reservoir Rehabilitation. Here, the company will work under tight timelines to achieve its October deadline to replace and repair concrete and plumbing, to pressure wash walls and re-waterproof two tanks and to install new floor topping. Outside of its construction activities, Fuller is affiliated with Bytown Brigantine and its Thomas Fuller Bursary Program that sponsors under privileged youth to take part in the sail training and leadership program. The family also continues to support the Heart and Stroke Foundation. For more information about Fuller Construction Co. Ltd., visit http://www.fuller.ca.